The use of imatinib, second and third generation ABL tyrosine kinase inhibitors (TKI) (i.e. dasatinib, nilotinib, bosutinib and ponatinib) made CML a clinically manageable and, in a small percentage of cases, a cured disease. TKI therapy also turned CML blastic transformation into a rare event; however, disease progression still occurs in those patients who are refractory, not compliant with TKI therapy or develop resistance to multiple TKIs. In the past few years, it became clear that the BCRABL1 oncogene does not operate alone to drive disease emergence, maintenance and progression. Indeed, it seems that bone marrow (BM) microenvironment-generated signals and cell autonomous BCRABL1 kinase-independent genetic and epigenetic alterations all contribute to: i. persistence of a quiescent leukemic stem cell (LSC) reservoir, ii. innate or acquired resistance to TKIs, and iii. progression into the fatal blast crisis stage. Herein, we review the intricate leukemic network in which aberrant, but finely tuned, survival, mitogenic and self-renewal signals are generated by leukemic progenitors, stromal cells, immune cells and metabolic microenvironmental conditions (e.g. hypoxia) to promote LSC maintenance and blastic transformation. 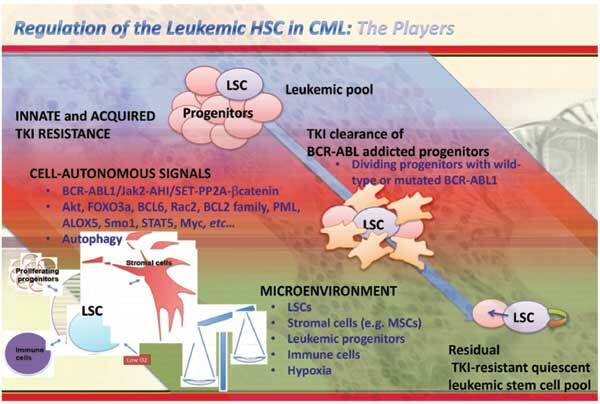 Stem cells, microenvironment, chronic myeloid leukemia, hematopoietic stem cell.